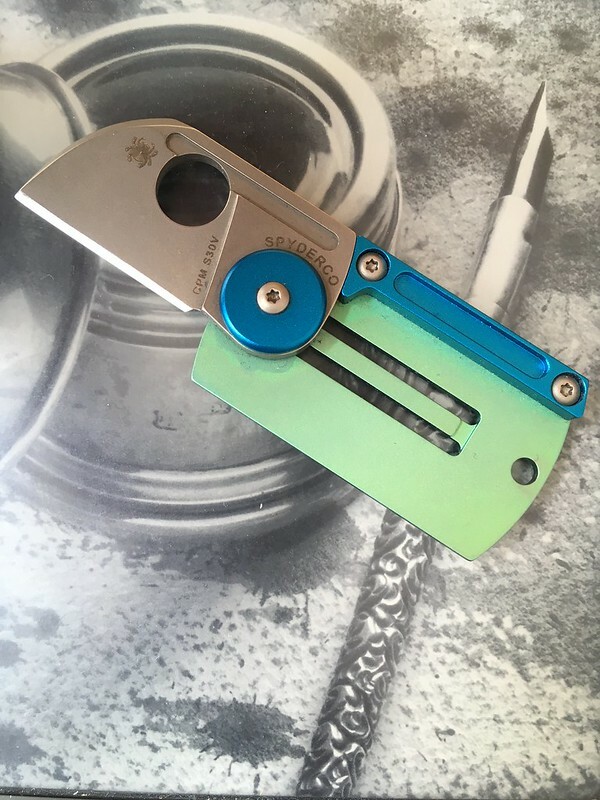 Recently Nemo offered me a chance to try out a Spyderco Dog Tag. 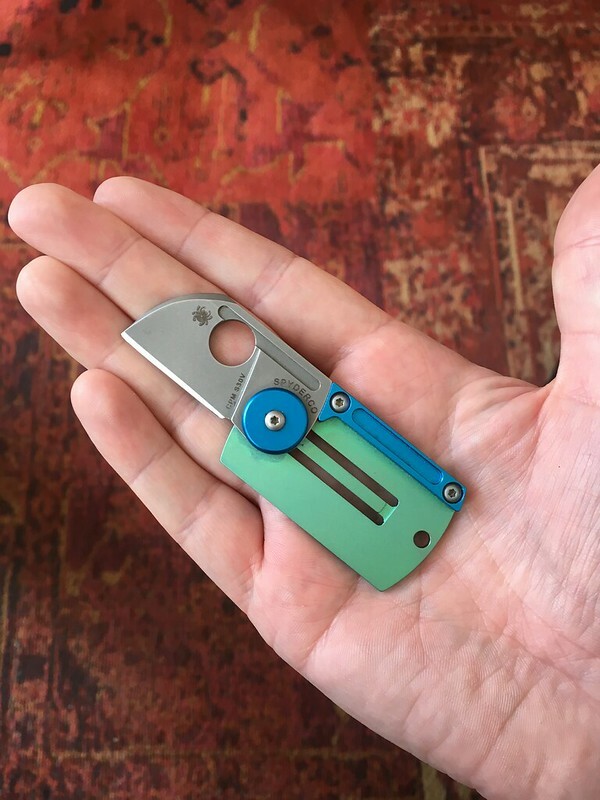 I gladly excepted the opportunity to see how this little knife would work for me! 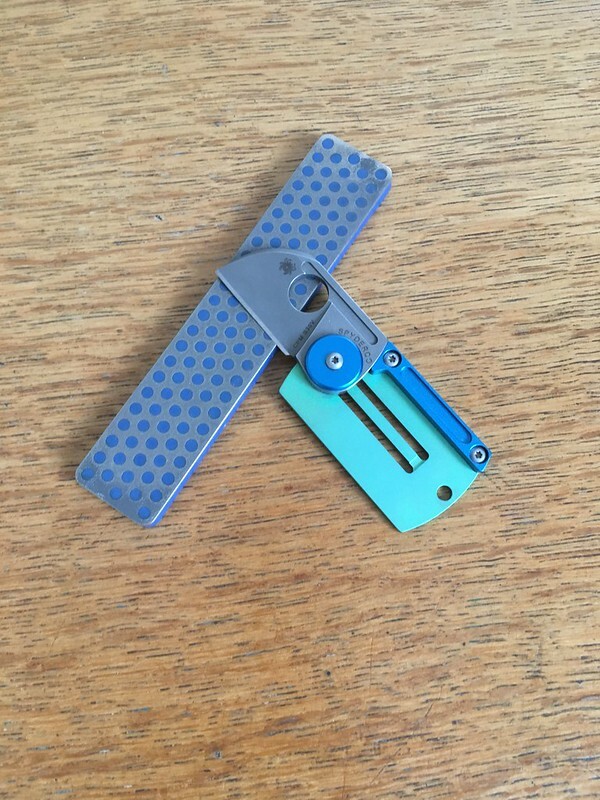 Spyderco’s Dog Tag folders are designed by knife maker Serge Panchenko and inspired by his customs. There are several version of this knife. 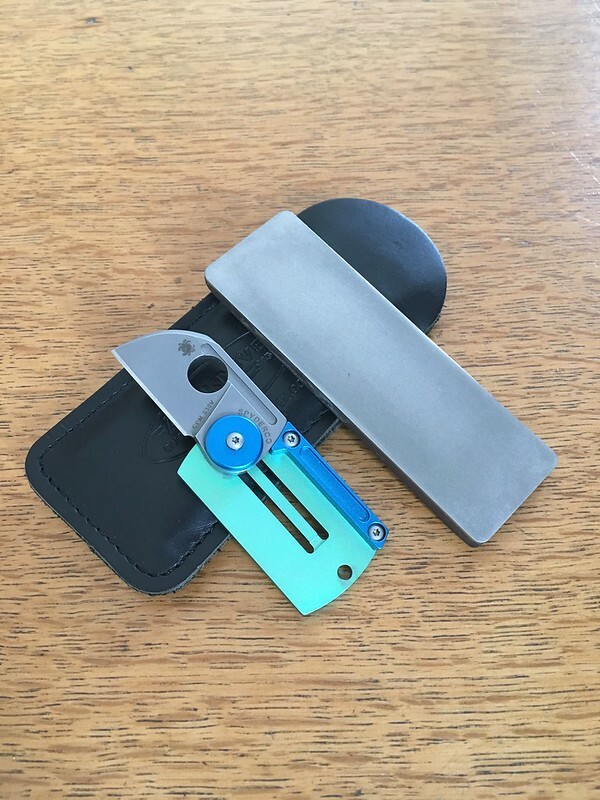 The one Nemo send me is the version with the green titanium handle and blue aluminium back stop featuring a CPM S30V blade. The overall length is 82mm and the blade length is 31mm. The blade is held in the open and the closed position by means of a detent ball on a titanium spring. Effectively it functions like a slip joint. When I received the Dog Tag from Nemo it still had the factory edge but it was not in new condition. It had been cut with. It was still sharp enough to slice receipt paper but not sharp enough to push cut it. The edge was still good as a working edge, but could be sharper. And, I do like to put my own edge on a knife! The blade has a two bevel chisel grind. The front side has a flat main blade bevel and small, also flat, edge bevel. The back is completely flat. I started sharpening the edge with the diamond side on my Fallkniven DC4 but soon found out that it was going to slow. The edge bevel had a sight wave in it as well. This is not unusual with an edge that has been sharpened on a belt at the factory. But it becomes visible soon after you start sharpening it on a flat hone. A little more work was needed to get the edge right and for that I switched to a DMT coarse hone. With that I would be able to remove metal faster than with the DC4. Besides getting the edge bevel even I also wanted to make it slightly convex so it would have a smoother transition from the edge to the main bevel. Convex chisel grinds on knives are not that well known but have been, and are used on performance oriented blades. For example Jimmy Fikes, one of the pioneers of modern blade smithing and performance testing, used to make tanto’s that were convex chisel grind. Another example are the traditional working knives of the Yakut of central Russia. That knife also has a convex chisel grind. This knife is used traditionally for, among other things, woodworking and cutting frozen fish. On youtube there are quite a few video’s showing how this knife it made and used. After I had used the DMT to removed the unevenness of the edge and had created a burr on the flat side of the blade, I knew the shaping work was done. Time to switch back to the DC4 to refine the finish and get her sharp! After having finished the work with the DC4 it was time to remove the burr that had been created. On a chisel ground knife you only shape the beveled side but you have to work both sides of the edge to remove the burr and make it sharp. Often with a chisel ground knife you remove the burr from the flat side by laying that side flat on the hone. As I did not want to scratch the finish of the that side of the Dag Tag, I lifted it just a few degrees of the hone. By going lightly I avoided creating an edge bevel on the flat side while still removing the burr there. On this knife the burr proved easy enough to remove. This suggests that the blade has had a good heat treat and had sustained non or little damage during factory sharpening. The resulting edge was sharp enough to push cut receipt paper as well as cut a free standing head hair. Nice! Into the pocket it went ready for use. 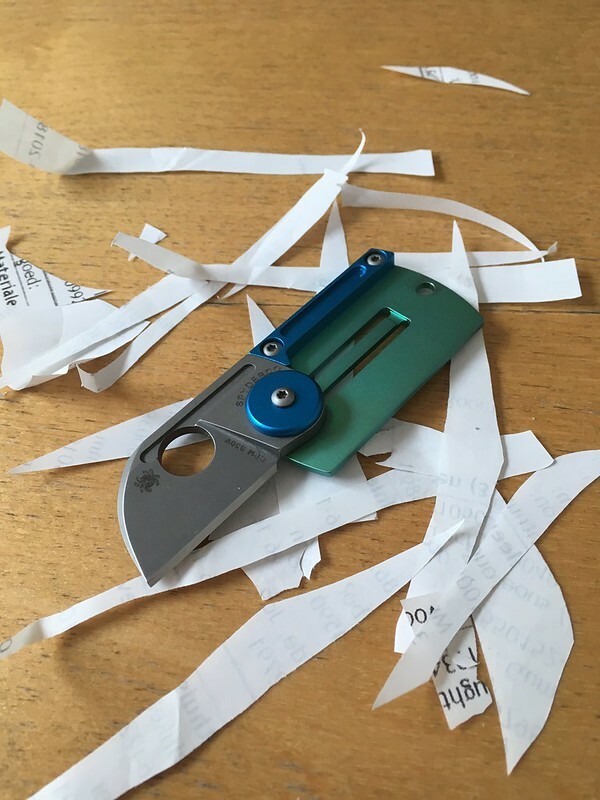 I took a few time opening and closing the knife to find out how to do it confidently as the knife feels different in the hand than most conventional folders. after playing with a little the process became fluent and comfortable. The Dog Tag can be opened by just using the opening hole while the handle lying on your fingers. 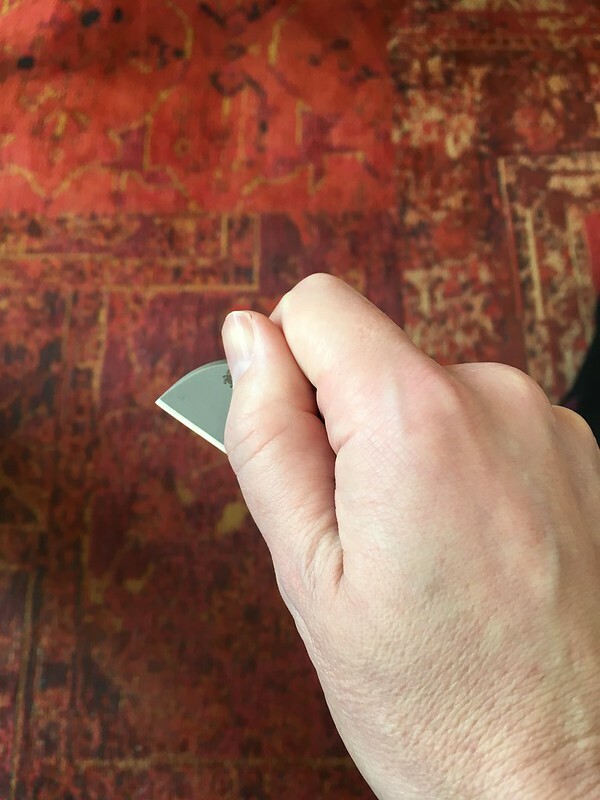 Or you can pinch open the blade between your thump and index finger and then snap the handle to the open position. Like in a Spydie drop. Good fun! Closing the knife is also very easy. A little push is enough to overcome the detent and swing the blade so it is once again covered by the handle. After a little practice its easy opening and closing action turned it into a fun fidgeting knife! Another advantage this easy opening and closing action is that the knife can be used very subtly. Handy when you want to open a package or remove a label in a public space where you do not want to draw attention your knife. When using small knives like this Dog Tag, I am always impressed by how capable they are. I can do almost all the things I use a pocket knife for with a blade of this size. The most notable exception is cutting larger foodstuffs. The fact that it is a chisel grind sometime made cutting straight a little bit of a challenge. But no more than that, a little. The small choil between the back of the edge and and the handle sometime hung up on what I was trying to cut. Like the sharpening choil on many knives can do. On a short blade I just notice it more. Other than these small issues it has been a fun and functional little knife!